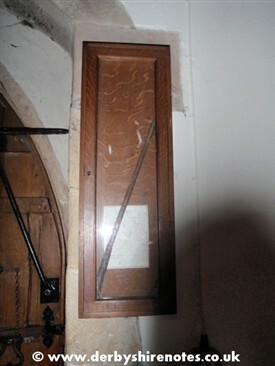 In Baslow, Derbyshire, there appears to be encased in a long glass case, a rather strange object for a church-a whip. However this no ordinary whip but a dog-whippers whip. Although no such whip survives in Nottinghamshire, there are a number of accounts in church records of the position of dog whipper. In simple terms, they were employed by the parish to remove unruly dogs from the church or its grounds during services. This was because it was common practice for parishioners to bring their dogs to church, these dogs would often fight each other and so it was necessary to have them removed. In some places, land was given, such as Dogwhipper’s Marsh in Chislet (Kent) to pay for their services. And that this was in 1842 still being paid. It is probable that the title remains at Southwell for it was remembered that in the 1950s, a George Paling was the official gravedigger and dog whipper. This page was added by R B Parish on 04/03/2013.